In the U.S. and most of the Western world, about one percent of the population will be diagnosed with celiac disease, an immune disorder in which the body can’t properly digest the wheat protein gluten. It leads to intestinal damage that can jeopardize nutrient absorption. But in Sweden, the rate of celiac disease is almost double that, at 1.8 percent. Sweden’s “epidemic” of celiac disease started in the late 80s and early 90s. While diagnosis rates in Sweden began to subside in the early 2000s, the country still has a higher rate of celiac disease than most of Europe. The medical community doesn’t know for sure what causes celiac disease, but genetics play a role, as you’re more likely to have it if a relative has it, too. In Sweden specifically, things like the timing of gluten introduction before or after weaning, serial infections in infancy and Swedes’ genetic predisposition to the disease have all been proposed as possible reasons for the explosion in diagnoses. Now, researchers from Umea University in Umea, Sweden, are adding to the conversation by examining the potential role that season and region of birth may play together in affecting a child’s celiac disease risk. Using data that includes nearly two million Swedish children born between 1991 and 2009, the researchers found that kids born in the summer, autumn and spring had about an eight to 10 percent increased risk for developing celiac disease compared to winter babies. It also found that children born in southern and central Sweden also had an increased risk compared to their northern compatriots. The chart below shows that children born in the southern region of the country have the highest risk of celiac disease. When regional data is combined with birth month and season, it shows that children born in the spring months of March, April and May and in the southern region of the country have the highest disease rate compared to winter babies ― especially those born in the northern region. The observational study could only call attention to these associations and heightened risks, so the researchers have no firm explanations for the discrepancy. But in addition to the aforementioned hypotheses for why Swedes experience more celiac disease, the researchers also guessed that abnormal levels of vitamin D, which helps regulate the immune system, could be to blame. The researchers also hypothesized that children born in the spring and summer tend to be weaned and introduced to gluten in the autumn and winter, which is also around the same time that infectious disease starts hitting the population. Viral infections could then influence gut bacteria and alter the intestinal lining, which could be the way celiac disease starts in these children. However, the study’s limitations include a lack of information about infection rates and vitamin D levels, so we can’t be sure why birth month and region may play a role, notes Armin Alaedini, a celiac disease researcher at Columbia University Medical Center’s department of Medicine & Institute of Human Nutrition who was not involved in the study. Geography may also play a role in this hypothesis because of the way viruses typically move through the country, the researchers note. Seasonal viruses take months to travel from the South to the rest of the country, which may be why higher rates of celiac disease start later for northern babies. “Among Swedish physicians, it is known that the yearly epidemics of respiratory syncytial virus, rotavirus and influenza start in southern Sweden and spread northwards over a couple of months, which supports our findings,” the researchers wrote. Insufficient vitamin D levels is also influenced by the changing seasons. Past research has already shown a link between low vitamin D levels in early childhood and immune diseases like type 1 diabetes and inflammatory bowel disease, but a few details get in the way of this hypothesis. For one, all Swedish infants receive vitamin D supplements, and secondly, the region with the least sunshine ― the North ― also has the lowest rate of celiac disease (exposure to sunshine triggers vitamin D production in the body). Another option could be that Swedish mothers in the South may actually be getting too much vitamin D, but more research needs to be done to explore this subject. Dr. Peter Green, director of the Celiac Disease Center at Columbia University, praised the study for highlighting the environmental factors that are often overlooked in celiac disease risk. 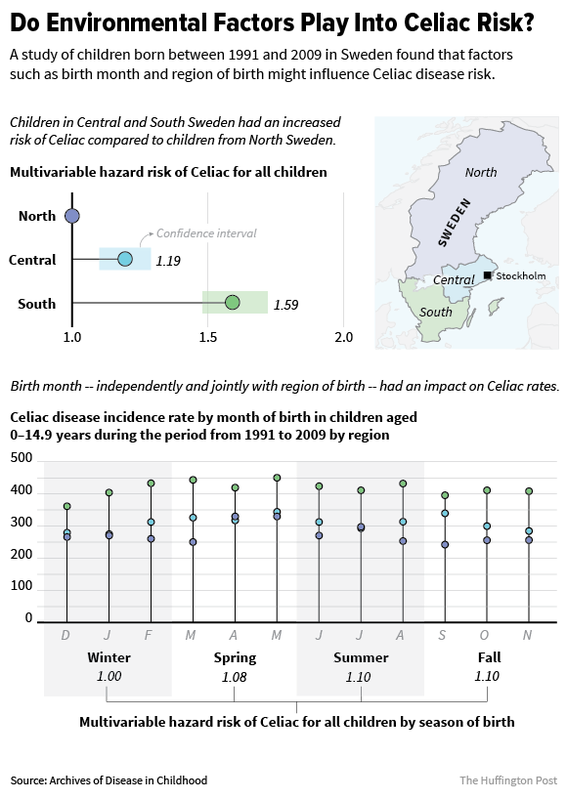 Green found in previous research that summer births were associated with a heightened risk of celiac disease, but the Umea University paper goes into much more detail and folds regional differences into the analysis, too. He also noted that seasonal virus patterns, as well as perhaps climate, might affect celiac disease risk for Americans and people in other parts of the world. The study was published in the journal Archives of Disease in Childhood.